Waiting On Wednesday is a weekly blog post hosted by Breaking The Spine where readers showcase which books they are highly anticipating. 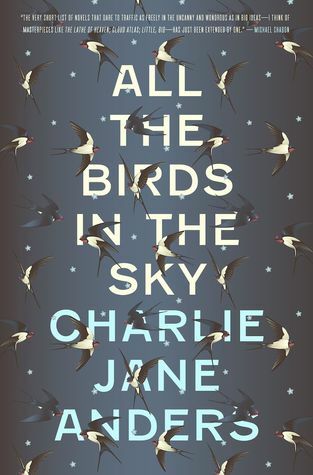 This week I'm turning my spotlight on All The Birds In The Sky by Charlie Jane Anders. But now they're both adults, living in the hipster mecca San Francisco, and the planet is falling apart around them. Laurence is an engineering genius who's working with a group that aims to avert catastrophic breakdown through technological intervention into the changing global climate. Patricia is a graduate of Eltisley Maze, the hidden academy for the world's magically gifted, and works with a small band of other magicians to secretly repair the world's every-growing ailments. Little do they realize that something bigger than either of them, something begun years ago in their youth, is determined to bring them together--to either save the world, or plunge it into a new dark ages. Since I'm curious, Have you heard of All The Birds In The Sky before? Never heard of this but I really like the synopsis. I think the cover is really cool too. Thanks for sharing it as I can see it going on my wishlist. I got this at BEA and met the author. It sounds SO GOOD and it's beautiful! Hopefully I'll get to read it soon. Great pick! By accident, huh? Glad you did! =) Sounds like a nice coming together of magic and technology. Great pick!